Pupils read and write every day, in English lessons and as part of their learning across the curriculum. Brecknock is a reading school. Adults and children share a love of reading which sits at the heart of all Literacy teaching and learning. From our sparkling library, to the effort and commitment that goes into day-to-day teaching of reading from Nursery to Year 6, children can’t help but develop a love for reading. Guided Reading begins as early as Reception or Nursery – as soon as a child is ready to read – and continues right through the school to Year 6. 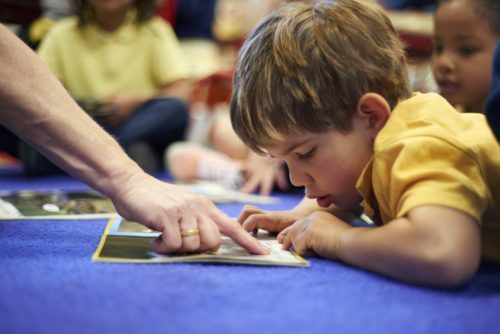 By carefully planning a set of well chosen questions, teachers are able to probe and develop children’s understanding of any fiction or non-fiction text. Beginning from the the early years, teachers link activities in the outside area to books, to help children immerse themselves into a story. Inside, they write letters, make lists, dress up, role-play and rehearse key language from the stories they are reading. As children move through the school, they still get the same level of immersion, but in different ways. For example, learning environments and rich book corners still allow children to engage texts, but there is an emphasis on making inferences at deeper levels, and to articulate ones feelings about a word, a sentence, or a whole text. Author Studies begin from Nursery and run right through to Year 6. Every year group in the school focuses on one author each half term. Authors are carefully chosen, so that all children experience the canon of classic stories (such as Charlotte’s Web and The Lion the Witch and the Wardrobe), but they are also given the opportunity to study new, ground-breaking authors (Oliver Jeffers/Guy Bass/Derek Landy). We believe that children thrive when they develop a love of reading and with our rich reading resources, every child finds an author they will cherish through to adult life. Brecknock works closely with the CLPE (Centre for Learning Primary English).This has allowed us to continually develop our staff at a high level for the teaching and learning of reading across the school. Training also focuses on using the ‘Power of Reading’ program effectively. ‘The Power of Reading’ is the best Literacy course in the country right now, because along with training teachers, they also provide schools with the best children’s books available, complete with planning ideas which our own staff can develop. Teachers share the practice they receive with other adults, and this helps us set the best possible texts for children to study in each year group. There is also a daily Phonics lesson for pupils from Nursery to Year 2, where children learn letter sounds for reading and writing. We use elements of the ‘Jolly Phonics’ reading programme which then leads into ‘Letters and Sounds’ and ‘Support for Spelling’ as the children progress towards ‘Grammar for Writing’. Once you add all the above to the best World Book Days, an engaging phonics and spelling curriculum, the latest and most exciting picture books, classics books, levelled texts to take home (from Reception to Year 6), and a rich online library for every child to access at their own level; then you begin to get an idea of just how important reading is at Brecknock.